Toronto artist-designer Deborah Moss, co-founder of the studio Moss & Lam, isn’t afraid of a blank canvas. Rather than being daunted by having a big void to fill—her custom pieces can be up to 100 feet long—a smile sweeps across her face when, at her massive, warehouse-sized workshop, a new bolt of beige fabric is stretched out for her to enliven with colour. “I love the way the brush moves across the canvas,” Moss says in characteristically soft, sweet tones. “I love colour, pattern, and texture,” she adds, as though that simple description somehow encompasses the diverse aesthetic she’s developed over her 30-year career. Some of her output has dream-like, Monet-esque hues, others Sol LeWitt–style geometries, and others still, ombrés that look like abstract sunsets. Moss’ work can be found all over the world, in some of the luxest locales. She’s created art (paintings and sculptures, 3-D wall finishes, murals and furniture) for ballrooms, lobbies, and residences in Hong Kong, the Four Seasons Hotel Kuwait at Burj Alshaya, and stores such as Saks Fifth Avenue, Tiffany & Co., and Louis Vuitton. 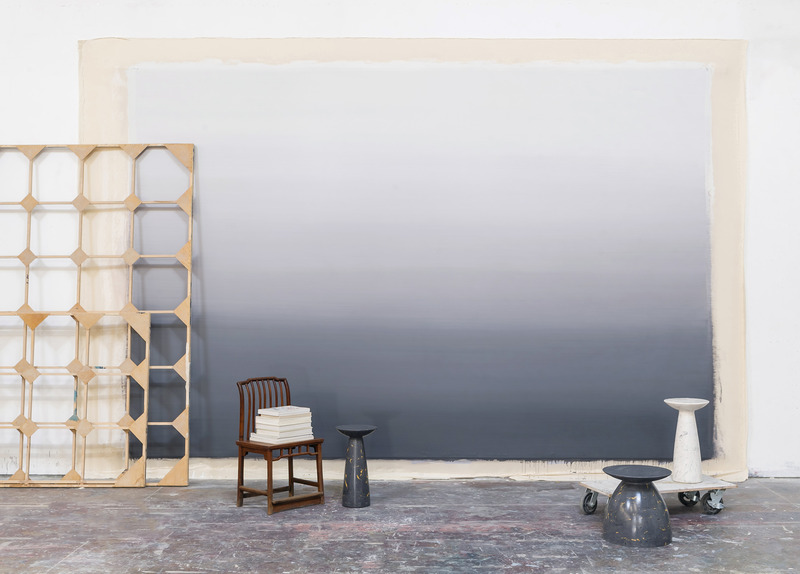 But if her name isn’t familiar, it’s because for a long time she has been a “secret resource of top interior designers,” she says in her workshop as a team of 25 artists and craftspeople buzz around, wielding paintbrushes and rollers. The majority of her projects are custom creations for the likes of Yabu Pushelberg and Tony Chi—names that occupy the headlines. Aside from a small collection of high-end, sculptural furniture—including tables, called W1, made with an ancient Italian technique called scagliola that mimics marble with a simple mix of plaster, pigment, and glue—the studio hasn’t directly interacted much with the general public. Until now. 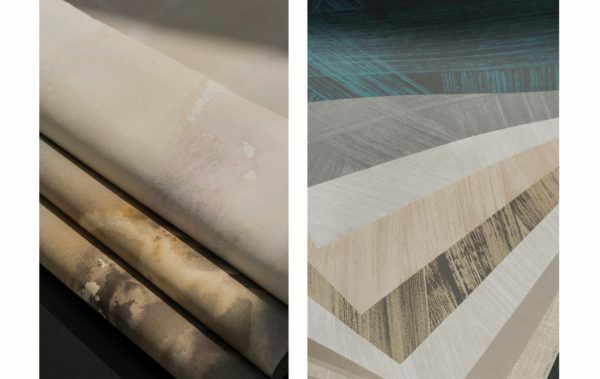 Recently, Moss started a new venture called Moss & Lam Canvas, a line of hand-painted wall finishes available online that can be up to a maximum of 16 feet by 50 feet. For the first time since the earliest days of the studio—when she and her late husband, Edward Lam, sponge painted people’s houses to pay their way through art school—homeowners can bypass an interior designer and cover their walls with Moss & Lam themselves. Importantly, this isn’t the interior design equivalent of couture versus ready to wear—an Yves Saint Laurent gown, say, next to a cotton T-shirt emblazoned with the letters YSL. Although each piece isn’t strictly custom—beyond the size, the designs are preset and only available in a handful of colours—every canvas is hand painted by Moss and her team (she estimates a four- to six-week turnaround time). Nothing is machine printed. “In a way, it’s a response to all the digitally produced wall patterns out there,” says Moss. “I still love things that are handmade, and I think there are people out there who will always value it as well.” Plus, there’s an advantage to the hand painted over digital approach: no seams for up to 50 feet. “When I see printed wallpaper, I see seam, repeat,” says Moss. “My eyes just go to that and it drives me crazy.” Without the lines breaking up the image, the effect is more immersive. “It’s like living in a painting,” she says. One of the options, for example, called Linen Fade, uses a technique where the paint seeps through the back of the canvas and creates an elegantly worn textile effect on the front. The technique—one that Moss has experimented with a number of times—was used in a collaboration with Toronto’s Yabu Pushelberg. “Glenn [Pushelberg] looked at a sample,” says Moss, “then turned it over and said, ‘I like the back more!’ ” Now, through Moss & Lam Canvas, more of us will get to see the work up close, maybe even flip it over and see what we think.